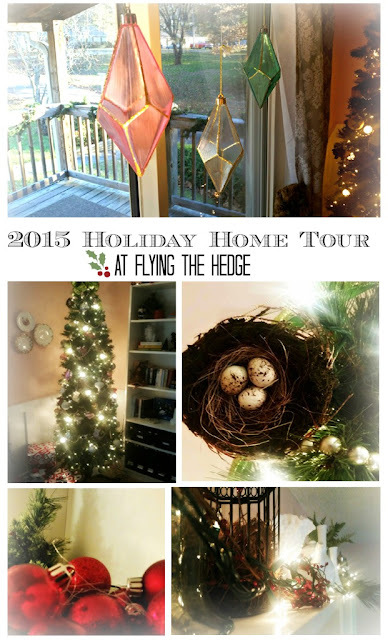 Welcome to my 2015 Holiday Home Tour! 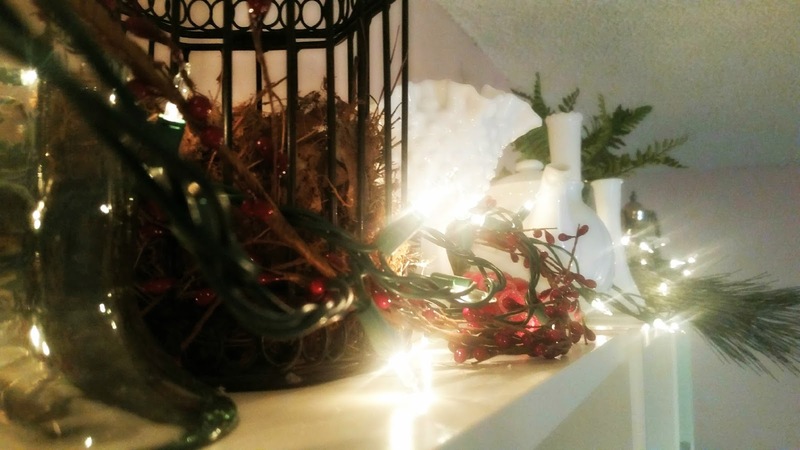 Unfortunately my first year blogging I didn't get around to posting a home tour because, well, we didn't decorate for a variety of reasons.However, we wanted our first Christmas in our new home to be extra special, so we went all out! Let's begin with the living room. We actually purchased a new tree for this house because our other two trees were either too small or too big. 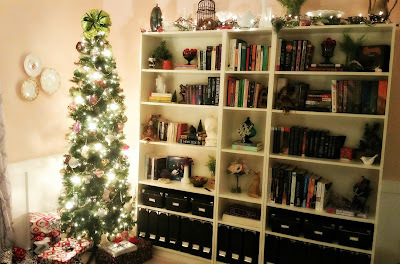 Because the library is so small, we knew we needed a slim tree. Furthermore, slim trees are more formal in my opinion. 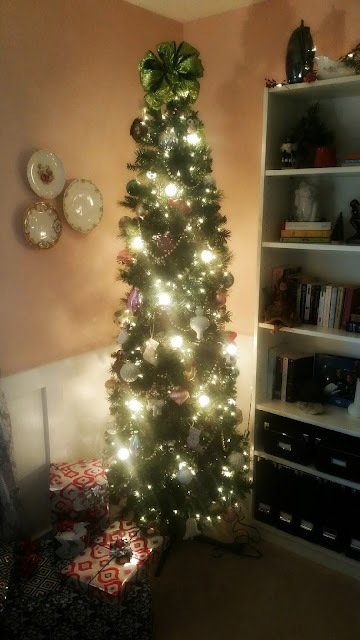 This is a formal space, so we needed a tree to fit the room. For ornaments we went with pinks, greens, golds, and whites which are the colors of the room. We actually picked up wrapping paper that will match the room, but I had already wrapped presents when we found it. Next year we'll use it! 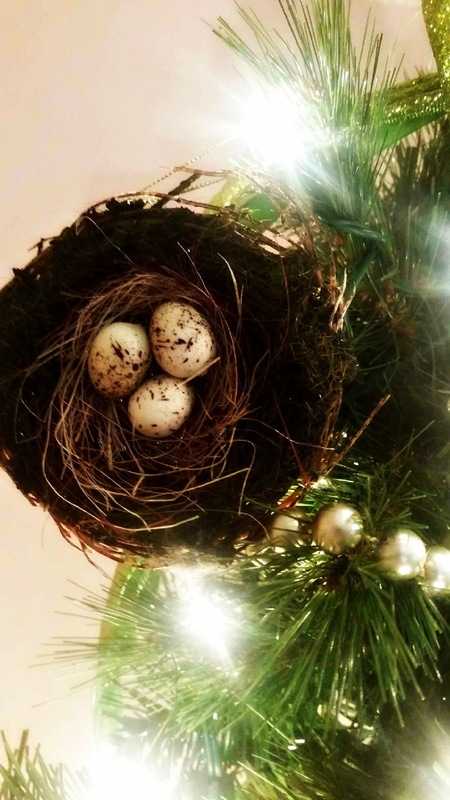 We have several formal looking ornaments surrounded by natural ones, including the nest featured above. 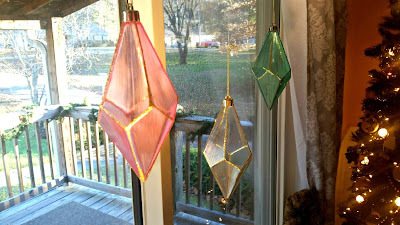 These are a tribute to the Earth and all her creatures.For more ornament ideas, see my Yule Correspondences post. 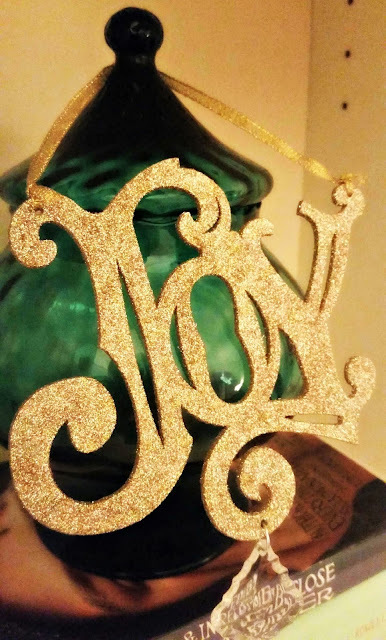 I added several decorations into our bookcases, including the ornaments and the word "JOY" symbolizing what this time of year is all about. In the window I hung three ornaments with fishing line. I love how they sway when the heat kicks on and the light shines through them casting pink, white, and green splashes on the floor. 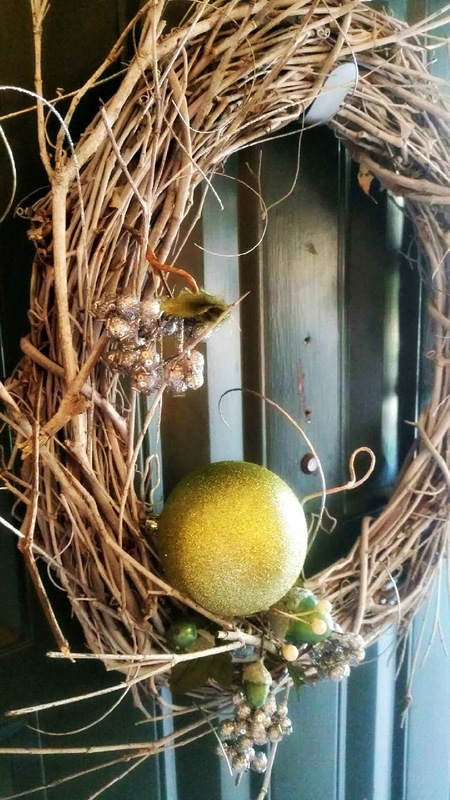 On our front door I hung the wreath I made a couple years ago. You can see a full tutorial here. The wreath was damaged in the move and I will be repairing it after the holiday season. I was going to before I put it up, but I wanted some time to think about new colors and ideas. I am probably going to add more sprigs and include pinks and golds with the greens. I hung this wreath in our kitchen window. This was actually given to me this year by my employers who no longer had a place for it in their new home. 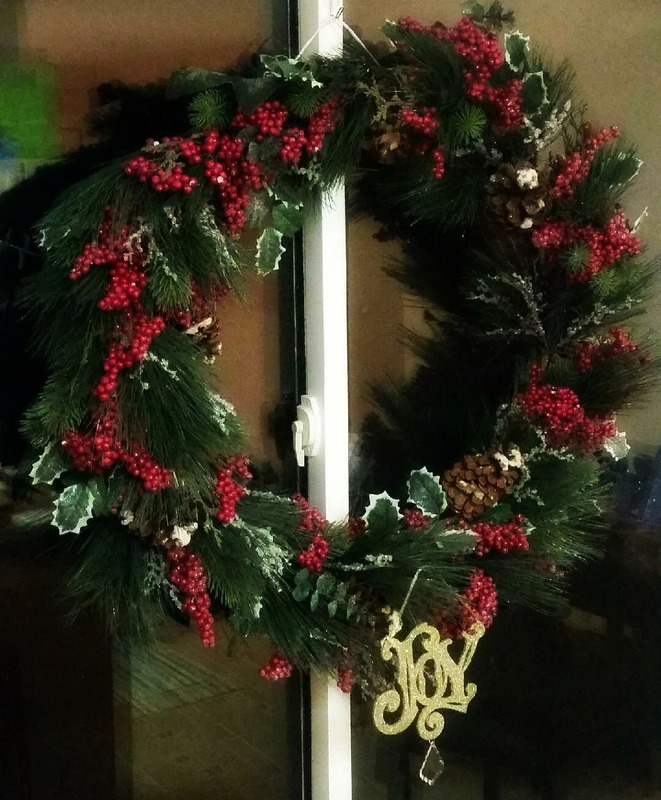 It is a perfect tribute to the Holly King with its holly berries, pine cones, and evergreen sprigs. I also places garland above my cabinets and covered them in white lights, but I couldn't get a picture I wasn't embarrassed of. Ha ha! And for the grand finale, the outside. We hung out icicle lights around the front of the house, covered the porch in garland and lights, wrapped the front trees, and hung lights and garland around the front fence. 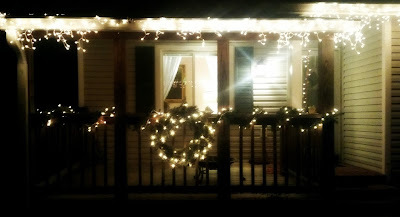 Next year we will be adding more lights to the yard, but for our first year I think we did a pretty good job. 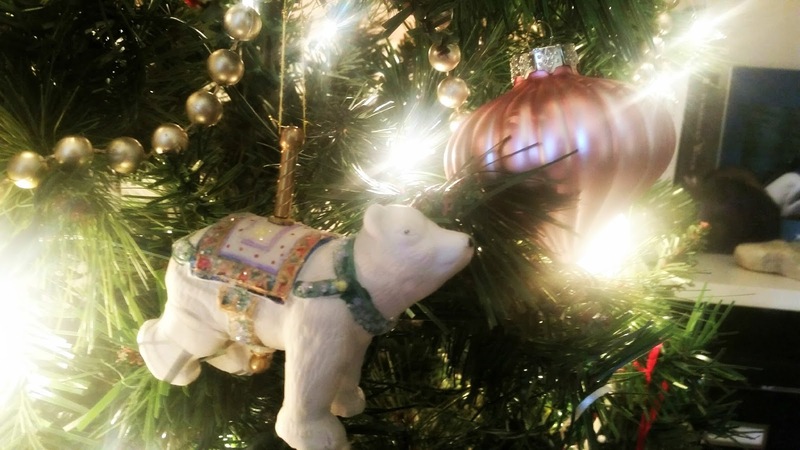 How is your decorating going? Yule is just a couple days away! 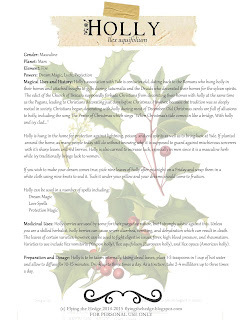 Magical Uses and History: Holly's association with Yule is centuries old, dating back to the Romans who hung holly in their homes and attached boughs to gifts during Saturnalia and the Druids who decorated their homes for the sylvan spirits. 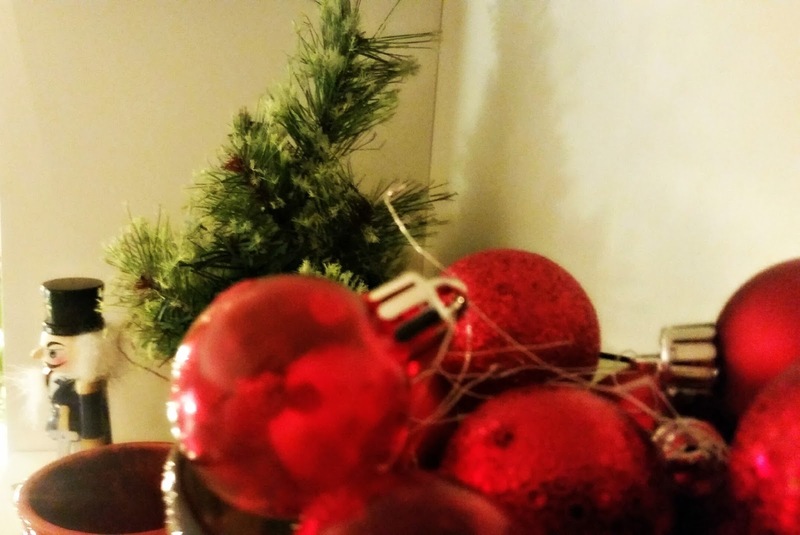 The edict of the Church of Bracara supposedly forbade Christians from decorating their homes with holly at the same time as the Pagans, leading to Christians decorating just days before Christmas. However, because the tradition was so deeply rooted in society, Christians began decorating with holly during most of December. Old Christmas carols are full of allusions to holly, including the song The Praise of Christmas which sings "When Christmas's tide comes in like a bridge, With holly and ivy clad..."
Holly is hung in the home for protection against lightning, poison, and evil spirits as well as to bring luck at Yule. If planted around the home, as many people today still do without knowing why, it is supposed to guard against mischievous sorcerers with it's sharp leaves and red berries. Holly is also carried to increase luck, especially in men since it is a masculine herb while ivy traditionally brings luck to women. If you wish to make your dream comes true, pick nine leaves of holly after midnight on a Friday and wrap them in a white cloth using nine knots to seal it. Tuck it under your pillow and your dreams should come to fruition. Medicinal Uses: Holly berries are used by some for their purgative nature, but I strongly advise against this. Unless you are a skilled herbalist, holly berries can cause severe diarrhea, vomiting, and dehydration which can result in death. The leaves of certain varieties, however, can be used to fight digestive issues, fever, high blood pressure, and rheumatism. Varieties to use include Ilex vomitoria (Yaupon holly), Ilex aquifolium (European holly), and Ilex opaca (American holly). Preparation and Dosage: Holly is to be taken internally. Using dried leaves, place 1-3 teaspoons in 1 cup of hot water and allow to diffuse for 10-15 minutes. Drink up to three times a day. As a tincture, take 2-4 milliliters up to three times a day. Now that I have discussed briefly the history and lore of Yule, I'd like to provide you with a list of correspondences! Magic: Being the time of rebirth, this is a great time to remove anything that holds us back and to sow the seeds for the upcoming year. Success spells are best cast this evening. Many people also perform blessings, not only for themselves and their families but for others as well. Cleansing your home and altar and banishing negativity can also be done this night. Whatever you do, make sure your heart is filled with peace, love, and joy and work magic to bring merriment to others. Can you hear it? Yule is in the air, filling stores, homes, cars, and the world with beautiful music and twinkling lights. Growing up, Samhain was always my favorite holiday, but as I have gotten older, Yule has taken its place in the spotlight. Why? 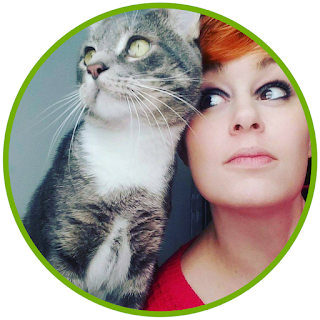 Because I love giving, and this is the time of year for giving. It is a great excuse to lavish gifts on not just my friends and family, but those less fortunate as well. It brings me great joy to help others. But where did all this gift giving, decorating trees, and Santa Claus come from? Almost all religions have a holiday this time of year and almost all of them are celebrations of light. There are Christmas lights, menorahs, Kwanzaa candles, and Yule logs lighting up homes across the world. Yule is no exception with it's aforementioned Yule log. Yule takes place on the winter solstice which falls on or around December 21st each year. On this solstice, the earth tilts away from the sun in the Northern Hemisphere, putting the sun at its greatest distance of the year. Celebrations date back millennia to the Norse, who viewed this time of year as a time for feasting and merriment; the Celts, who gathered mistletoe and sacrificed a white bull; and the Romans, who held Saturnalia by giving gifts, feasting, and allowing the slaves special liberties. All of these traditions were well established by the time Christianity began popping up across Europe. They had an incredibly hard time converting Pagans who wanted to continue celebrating their holidays. They began building churches on Pagan worship sites, converting Pagan symbols into Christian ones, and before you knew it, they had everyone celebrating Christmas on December 25th. The idea of decorating a tree with ornaments and lights is actually quite an old tradition that predates Christianity. During Saturnalia, celebrants often decorated their homes with shrub clippings and hung ornaments in trees around their homes. The Egyptians decorated with palm fronds, their symbol of resurrection and rebirth, while early Germanic tribes (where the tradition of the Christmas tree very likely originates from) decorated evergreens with fruit and candles in honor of Odin. It is also the early Germanic tribes who provided us Pagans with the word Yule and the tradition of the Yule Log. 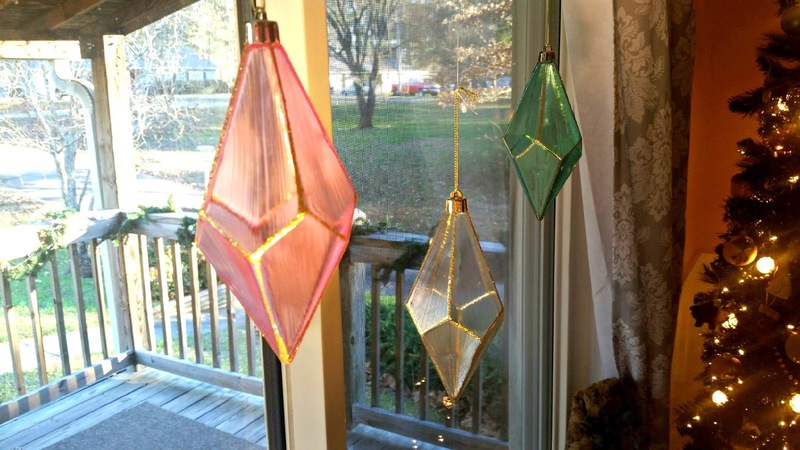 Common ornament ideas include suns, stars, pentacles, acorns, feathers, dried oranges, cranberries, holly, pine cones, cinnamon sticks, antlers, eggs, horns, colored balls (red, green, gold, and white) and of course lights, lots of lights. And Santa Claus? Well, he comes from a mix of traditions, both Christian and Pagan. He is primarily based on St. Nicholas, a 4th-century bishop from modern day Turkey. He was known for giving gifts to the poor and even paying the dowries for a man with three daughters to save them from prostitution. However, the idea of reindeer and hanging stockings by the fire comes from a Norse tradition. Odin was often shown riding an eight-legged horse named Sleipnir, which later became reindeer. During the winter months, children would place boots near their chimney filled with food for Sleipnir, and Odin would leave gifts in return. The name Santa Claus, however, originates from the Dutch word Sinterklaas. Santa is based on dozens of traditions, which I will cover later (See Ms. Misantropia's comment below) . However, for many Pagans, Yule is the celebration of the Holly King who reaches his peak only to be defeated by the Oak King the following spring. Today we hang stockings by the fire, leave reindeer food on our lawns and decks, decorate evergreen trees, cover our houses in lights, and make sure we are good all year to encourage Santa to bring us gifts instead of coal. I love this time of year, even if Christmas is the predominate holiday here in the States. I smile at every Merry Christmas and wish them the same right back. In the end, it doesn't matter if they hijacked our holiday. It doesn't matter if they wish me a Merry Christmas or Happy Holidays. All that matters is that we give to one another, especially those in need, and we spend the month of December with a smile on our face celebrating one of the most amazing astronomical events of the year. This is the time of year to come together, no matter what faith you come from and celebrate together. To learn more, please read the Yule Correspondences post.